welcome to BanDao Global Group Ltd! This is not an ordinary pen. Yeah it’s not only used for writing but it also has a built-in DVR (Digital Video Recorder) with HD camera which can be used to capture/ produce high resolution photos and video with sound. Within the pen there is a hidden camera, it’s almost unseen. It’s indeed a cool gadget which is great for monitoring and capturing any situation or for just having some fun. • 1.with Video record, and Photo capture. • 2.AVI 720*480 26fps, JPG 1280*960. • 3.with TF card slot, up to 16GB. You can make videos without being noticed by the others, for example: stealth surveillance, listening to a speech, record presentations and more. 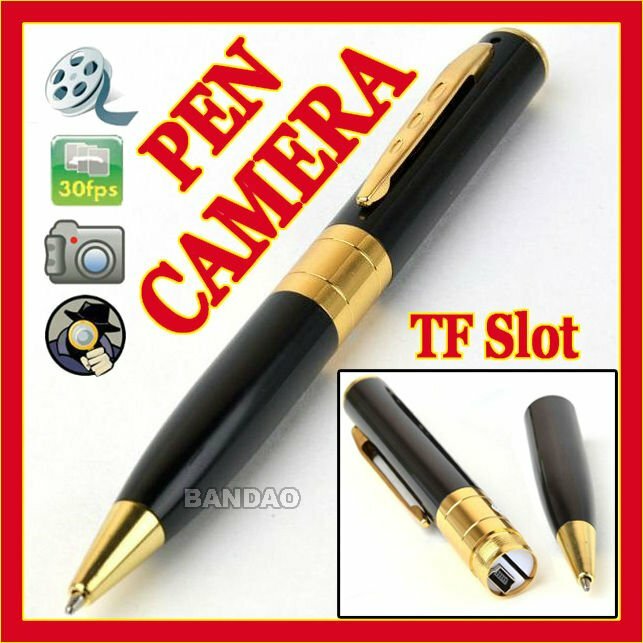 This Pen Camera DVR is perfect for sales people, lawyers, law enforcement, mystery shopping, covert surveillance or internet fun. It’s an affordable business person’s accessory or a cool gift idea. • Built-in 150MAH rechargeable lithium battery, can work about 50min continuously or more. • Video record with sound,720×480 video resolution and 26 FPSof AVI format MJPG encoding. • Replaceable standard pen cartridge. • One key for video record, and photo picture etc. NOTE:no memory inside, if you need memory, you can add USD6 for 4GB TF card, USD10 for 8GB TF card. The casing, color, and appearance, or HDD Player's menu may be changed due to different batch, I will not inform regrettably. If you need specifically color (must be described in item's listing), and other specifically requirement. pls write down your requirement in note, we will try hard to meet your requirement if it is in stock, if you didn't do it, I will not be responsible for improper item sent to you. If you want to buy in large quantities, please see my shop and enter wholesale catalogue or send email with the item name and quantities that you require, then we will quote you the best price. 1. Registered mail(post to most of country): Normal arrival at destination 18-29 days. 2. Express(DHL/EMS etc): Normal arrival at destination 3-8 Working days.